Hi guys! Are you ready for some totally awesome fanmade merchandise? I am, so it doesn’t matter if you are! Fabulosity after the break! First up is this lovely Gilda custom! She’s made using a brushable pony as a base, so she’ll fit in just right with your collection if you’re like me and find blind bags just too tiny. She’s at about $30 on ebay with slightly under 11 hours left! Next up is a pretty awesome 16″ x 8″ (yes, that is huge!!) 8-bit Rainbow dash magnet made from perler beads for $25! Pony pillows! These lovely pillows (yes pillows, not pillowcases! They’re shown here unstuffed, but the pillows themselves come fully stuffed) are just $13 and feature silhouettes of your choice of the mane six, Derpy or Dr. Whooves, plus the seller takes commissions! Cutie mark tote bags, yes please!! For just $8 you can get any cutie mark you want, on any color tote you want! Now you can carry things around in true style- forget designer handbags, we have ponies. I can’t pinpoint what it is, but there is something so ridiculously cute about Twilight in amigurumi form. Yarn just seems to suit her. This little cutie stands 7″ tall and can be yours for $80! 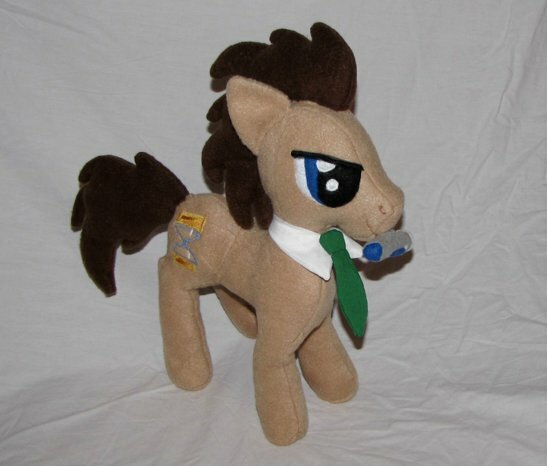 How can you go wrong with pony David Tennant? Oh my goodness, if this isn’t the cutest little thing. This Derpy plush is made to hold a sort of walking/flying pose, talks (she says “anything I can do to help?”), and comes with a mailbag, muffin, packages, and a little posable chameleon buddy! Unsurprisingly, she’s at almost $500 with 3 days left on the auction. Now, before I give you links, I just want to point something out: the packages are actually addressed. The maker of this girl really went all out! Eep! This thing is just so cute, and I just want to hug it, can I please hug it? ohmygoodnessgracious. Her auction on ebay has 3 days left, and she’s currently at $20! And finally, some Derpy amigurumi! Awwwww, I could just snuggle her to bits. She’s up on etsy for just $35, too! And that’s all, folks! I’ll see you next week with some more great ponies and pony-related things! As always, submissions are appreciated whether they’re your creation or just something really awesome you found on the internet! You should check out Groovebird’s sculptures, they are amazing. Oh wow, those are gorgeous! Thanks for the link!